Maybe we should get back to basics and start gathering some facts about one of natures healthiest foods: nuts. Nuts are great. A few tips: Always go organic and raw when you can. Store them in the fridge immediately after purchase. Be weary of any possibly rancid nuts that smell like 'paint'. Do not over-do the salted nuts if you are watching your sodium intake. Read labels and make sure there is no added saturated fat to your nuts--typical for many roasted and salted varieties. 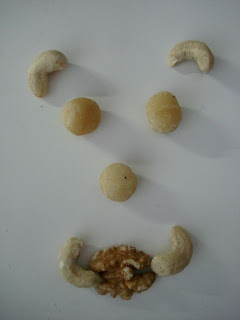 The mellow, almost creamy flavor of a cashew is divine. 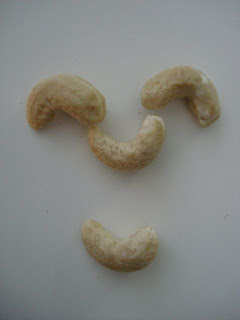 A 1 ounce serving of cashews contains 30%copper RDA, 20% magnesium, and 10% iron-just to name a few. 160 calories, 4 grams of protein and 3 grams saturated fat. 10 grams of GOOD fats. Possibly the most diet-friendly of nuts-simply because of their very low saturated fat content (only 1 gram per ounce), high fiber content (3 grams per ounce) and nutritional benefits. Almonds have 35% your RDA of vitamin E and Manganese. As well as 15% riboflavin, copper and phosphorus. And 6 grams of protein. Eat more brazil nuts--at least one a day! One brazil nut has 100% your RDA of selenium. One ounce has 780% your RDA of selenium! What's so great about selenium? Well, Dr.Weil notes that "Selenium has antioxidant properties that help the body prevent cellular damage from free radicals, and one of its most valuable roles is as a cofactor of an important antioxidant enzyme in the body called glutathione peroxidase. Selenium also helps support a strong immune system, regulates thyroid function, and may help reduce the risk of prostate and secondary cancers. It also plays a role in the prevention of cataracts and heart disease." Fun to eat if you crack your own--and good for you too! 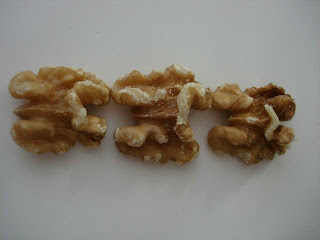 Walnuts (1 ounce) contain 50% manganese, 8% folate, and 25% copper. One very significant fact about walnuts is that they contain OMEGA-3 fatty acids--similar to those in salmon and other fish oils. So if you are vegetarian--eat more walnuts. You may think of pistachios as that crunchy green crumble found on the top of middle eastern desserts, or swirled inside of pistachio ice cream...but pistachios are just as healthy as their nut friends. One ounce contains 20%RDA copper, manganese and vitamin B6. And 6 grams of protein. Plus, they are easily de-shelled without a nutcracker, and are just as high in fiber as almonds-3 grams per ounce. If you've been to Hawaii, you have probably tried a macadamia nut...however it may have been covered in rich creamy chocolate or oily sweet coconut shreddings. Try them raw, organic and unsalted to taste the real thing. These creamy round nuts are delicious and macadamia oil has long been touted as a superfood in oils. One ounce of nuts contains 45% manganese and 15% thiamine. Several studies have touted macadamia oil-found in raw nuts to help lower cholesterol--despite the high fat content of these nuts. OK, I have to put in the USA's favorite nut...the peanut. It may not be the most exotic of nuts, but grown right here in our own backyard of America, it needs a bit of recognition. One ounce of peanuts contains 30% manganese, 7 grams of protein and 12% your RDA of fiber. Peanuts may be 'cheap' but they are quite the nutritional powerhouses. No wonder peanut butter has long been called a dieters friend when it comes to stalling hunger and gaining nutrition. "Researchers from Harvard Medical School and the Harvard School of Public Health have examined the effect of eating nuts on cardiovascular health, reports the Harvard Men's Health Watch. "Their work shows that nuts really are healthy, especially for men at risk for heart disease," says Dr. Harvey B. Simon, editor. So, don't worry about the high calorie content of nuts...and simply replace your regular "chip munching" with "nut-nibbling" Your heart and body will THANK YOU!